I got this unit (mine is color blue) from a friend who seldom used it and I was lucky to be the one to have it. I was focused in buying the MSR filter but when I looked at reviews the Katadyn filter topped the MSR filter in terms of durability and usefulness. The first time, I tested it using ordinary tap water (our tap water in Bacoor Cavite is not potable) and drank the filtered water. I was really nervous as my stomach is really sensitive to water impurities and oftentimes I get stomach pains. To my surprise I did not get any stomach pains at all (or worse LBM hehehe). The water was clear and clean. I knew then the filter was doing what its supposed to do. 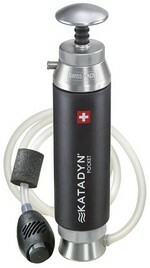 Durability and usefulness are on TOP of the requirements (lightweight is another thing) when I look at mountaineering gears, and Katadyn Pocket Water Filter is on TOP of the list. You wont worry if it gets bumped at or accidentally, you drop it during a climb or trek. The solid Aluminum and plastic construction is really really tough!!! Try to break it and you will fail hehehe. I won’t hesitate to bring it during long treks and major climbs specially if carrying a lot of water is impossible. This entry was tagged Camping Gear Reviews, Hiking Gear Reviews, Mountaineering Gear Reviews. Bookmark the permalink. I have come across this product at REI when I visited Oregon 3 weeks ago. They’re a huge outdoor equipment store and their range of equipment is amazing. Anyway, I was going to buy the Katadyn too because of the fantastic reviews but I came across the Sawyer All-In-One Water Filter. It cost me $70 and what really sold me on it was it didn’t need replacement filters, meaning I don’t have to buy anything more after this kit. Does the Katadyn need replacement filter cartridges too? It must be a great item and your article makes me think about getting one in the near future. I’m not as skilled in the outdoors as you are, but we have similar interests. By the way, I also purchased my BioLite Stove from REI and really love it too. My own review for my Sawyer and BioLite will come soon. I will cite you however as the 1st guy that I know of in the country who has reviewed the stove. Keep up the good work! Hi TZH. Wow it’s great that you were able to buy the Sawyer All-in-one water filter. Wish that is available here in the Philippines…. and you have the Biolite (all smiles right now). You will have lots of great time using it, definitely!!! As for the Katadyn, yes it will need filter replacement once the silver impregnated ceramic filter becomes too thin….. I have never replaced it yet though. It’s really a work-horse. Looking forward for your reviews and thank you very much for dropping-by. “Mount Mantalingahan will bring out years of experience in trekking. This mountain has one of the most difficult trails. You need to prepare well to complete this trek.” In 2014 The post Mount Mantalingahan: The conclusion of the Knife-edge Trilogy appeared first on SMB. HAPPY NEW YEAR!!! MORE ADVENTURES AND SMILES THIS 2018!!! GOD BLESS!!! The post 2018 is here!!! Quo vadis SMBerks? appeared first on SMB. The group decided to climb Mount Guiting-Guiting last April 29, 2017. Previous attempts last year (and the years before) failed to push due to schedule conflicts and logistical issues. What The post Mount Guiting-Guiting Dayhike – Our best yet for the year 2017!!! appeared first on SMB.